Later Iona silverwork and the C.A.I. Many thanks to E. Mairi MacArthur, author of "Iona Celtic Art, The Work of Alexander and Euphemia Ritchie" for all her help with information about the Ritchies. This website is a tribute to the remarkable creative genius of the Ritchies, and our intention is to show some fine examples of their work, as well as pictures of the wonderful environment and ancient carvings of Iona that inspired them on their lifelong journey of producing magnificent and unique Celtic crafts. We do hope you enjoy the site, and we welcome your comments and feedback. If you have any interesting digital pictures of unusual Alexander Ritchie Iona silver or brasswork items you would like to send us, we will be happy to include them on the site for others to enjoy. 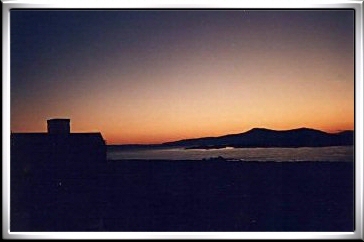 Grateful thanks to Simant Bostock for the use of his beautiful pictures of Iona on this website. Simant has a vast photo-library of ancient sites, from megalithic to Celtic Christian, and ranging from The Hebrides to Malta. If you are looking for a specific picture for web or publishing purposes, please email simantbostock@i12.com. Thank you also to Virginia Hodgkinson for use of her photos.